Founded in 2014 by serial entrepreneur Chris Olshan and his wife, Kristy Olshan, Surly Penguin & The Distillery was a dream forged by hard work with a kiss from luck and fate. As in the case of many great inventions, the business was born out of an unsuccessful experiment. Chris’ wife Kristy loves citrus fragrances. Chris determined to create, as a Valentine’s Day gift for Kristy, a citrus body oil and accidentally infused the oil with alcohol. Lightning struck. And the Surly Penguin Grapefruit Cordial was born. Rave reviews from friends who tasted Surly Penguin Grapefruit Cordial inspired Chris to dream of opening a distillery. After searching for over a year they finally found the perfect property. The distillery is situated on 17 acres of private forest reserve filled with thousands of raspberry bushes which supplied the first locally grown fruit for the business. A brand new bank barn had been constructed on the property which was quickly converted into a working distillery. They harvested the raspberries by hand, juiced them and added them to the infused alcohol creating their first artisanal spirit. Surly Penguin is changing the way people enjoy and consume artisanally-crafted distilled spirits by creating products that are designed to be as delicious as the fresh fruits we use. Every cordial Surly Penguin creates is made with hand-picked, hand-juiced fruits and ultra-pure spirits that are six-times distilled, GMO free and organic. 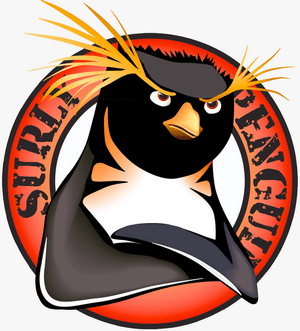 The Surly Penguin Distillery is creating hand crafted cordials and bespoke liqueurs. Sourcing fruits, herbs and spices from local farms, our new 26-flavor liquor brand delivers premium quality products. From the stills we use, to the fruits we hand-juice, to our bottles and labels, every step of the Surly Penguin process happens right here in the USA. Craft a premium quality spirit using only the finest ingredients, so that every sip tastes as delicious as the locally sourced fresh fruit from which it’s made. Be able to count on one hand and pronounce every ingredient used to produce the spirit. Use only the best fruits, herbs and spices – no added chemicals or additives and nothing artificial. Infuse REAL authentic flavors and always be 100% UNCOMPROMISING!